Payette Custom Creations Blog: Who Wants a Misti??? 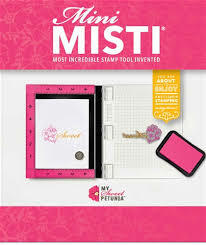 A very nice couple of ladies came into the store yesterday looking for some stamps and dies, which of course I don't have in stock yet :( As they were leaving the one lady asked if we were going to carry the Misti... OMG YES!!!! My only issue with this is that I want one of each all for myself! Who doesn't? I think I could manage to do everything with the Memory Misti but I still want them all. Is there anyone else out there who needs to have one of everything in a crafting series? No? Just me? Well, don't tell my husband then because he thinks all of us crafters are the same haha. Beside the photos below you will find the Payette Custom Creations price and product numbers, if you want to order one please let me know I would love to fill that order for you. Also, we have a description below from their website letting those who don't already know about them what they're all about. Do you have a Misti? Do you love it? Hate it? How do you feel? Do you want a Misti? Why? What is most appealing to you about it? Please leave us a comment below telling us and others what you think. Oh and if you want to order one you can tell me then too. If we have enough interest then we'll get these in stock even sooner.